I finished! 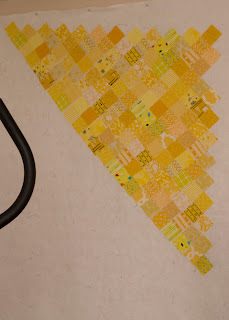 My sewing goal for the weekend was to finish up this quilt top. It only took one late night. The finished size is 70" x 90". 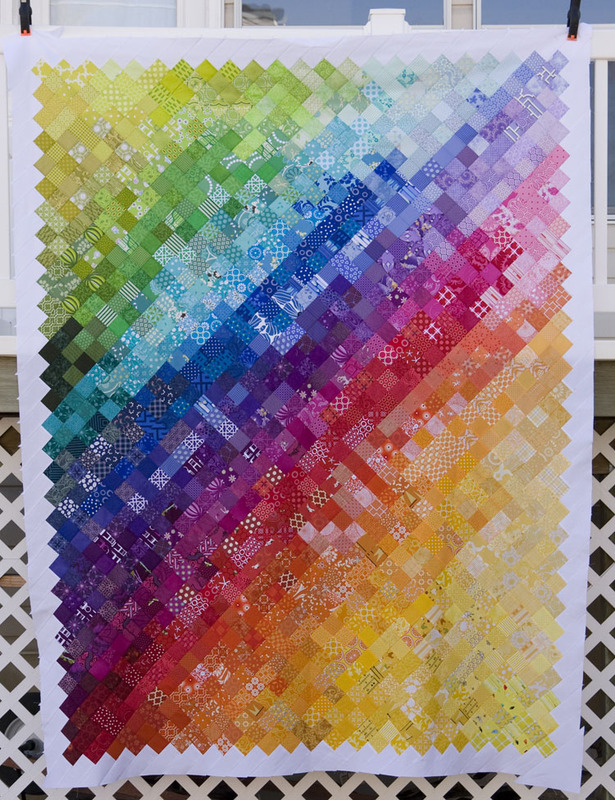 I used 1328 squares (2.5" cut). That comes out to 332 charms. So when people think I'm crazy for wanting to run a huge charm swap, this is why. I'm just about out of charms. And yes, I do have an idea for what I'm going to do with the next batch. My original plan was just to slice off the points of all the outer squares, but I just couldn't stand to do that. I came up with this idea for the border instead. 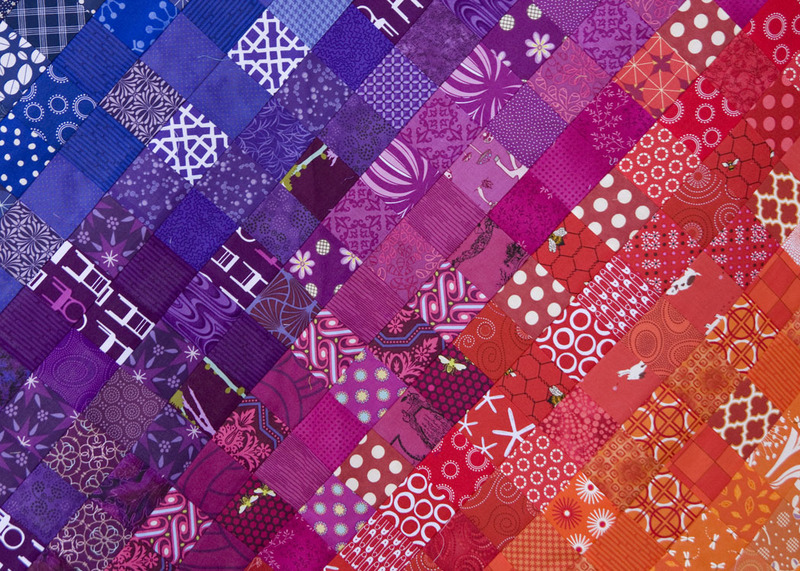 I love the look of the pinked edges of the quilt. 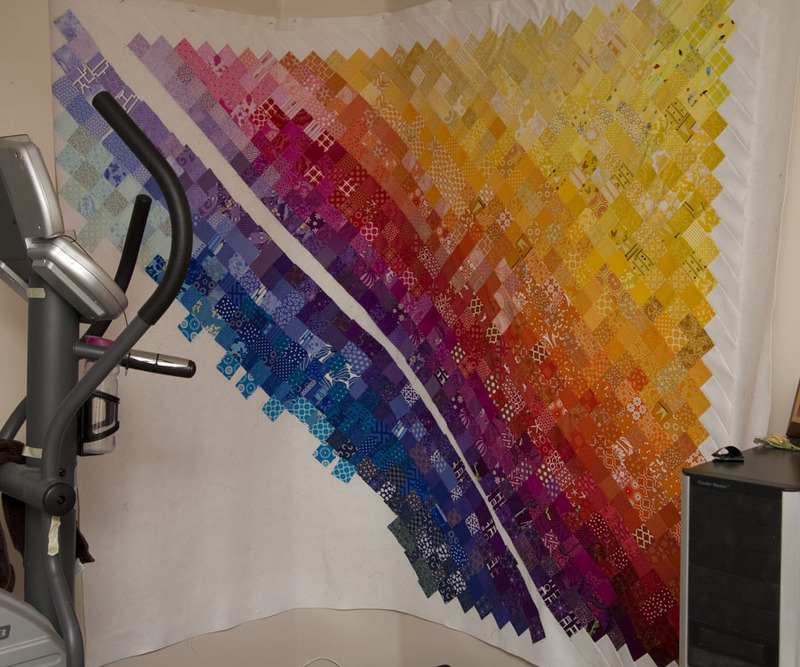 The design process was a lot of fun, despite the fact that this quilt took over my wall for close to two months. 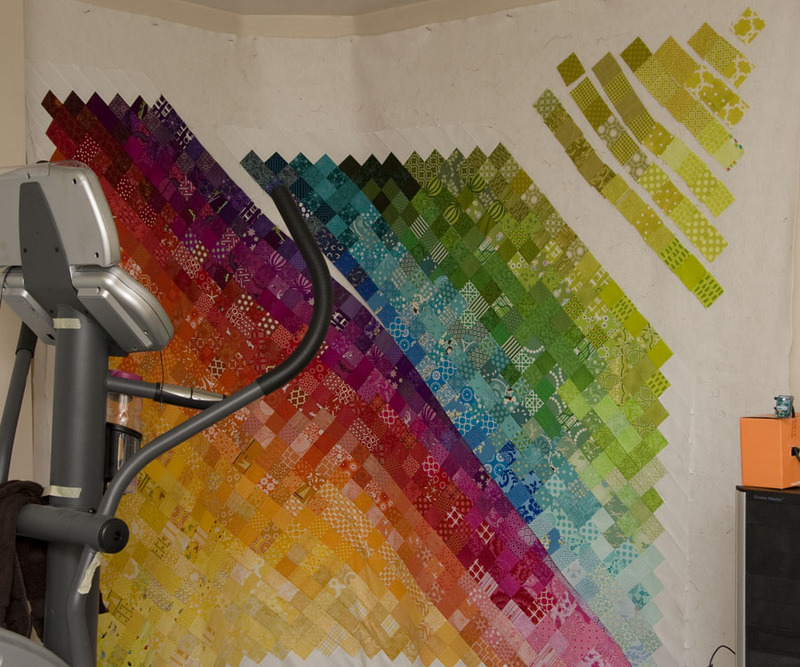 At this point it became too hard to design it behind our elliptical trainer so I flipped the entire quilt around to finish the design. This is our only free wall in the house that I can use as my design wall, so I make it work. I now have a naked design wall again. Our office/sewing room looks quite boring without all the color on the wall. Now onto the quilt back. I need to fill that design wall up again. Kati, its just incredible. Utterly gorgeous! Such a gorgeous, fun quilt! I *love* the pinked edges! WOW!!!! INCREDIBLY BEAUTIFUL! And I can see a square of my blue-purple contribution!!!! This is just amazing! Like, crazy amazing. The kind of thing I can show my husband & I know it will impress him! I love the pinked look of the edges, what an inspired choice. Really nice work...I will await the next charm quilt! I love it, it is just wonderful! And so inspiring. It is incredible! Can't wait to see how you finish this up. Gorgeous! I'm up for a charm swap too! Oh wow! That is so awesome :-D What a huge accomplishment. Thanks for sharing your hard work! I love it! You really are becoming quite the quilting color wheel expert. I'm glad I'm not the only one staying up late! Great quilt woman! Kati! Once again I am just blown away by this! You are amazing!! It's beyond words! AMAZING! Just AMAZING! 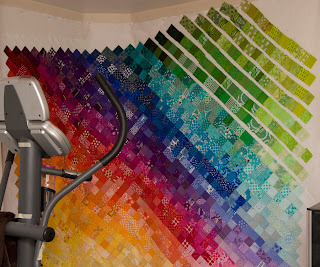 Another amazing quilt. Nice to see the progress on the design wall. Absolutely Stunning!!!! Love the pinked edges too. Gorgeous! What an amazing project. WOW. Just. WOW! It is stunning! And, I agree, LOVE the 'pinked' edge look! GREAT job! That is beautiful. One of the first non-quilt (maybe the first?) projects I made was pillows for my Dad, using what I thought was a watercolor technique. I used this same technique of shading from corner to corner. I've been planning a mini using this idea and this inspires me to finish up! That's just amazing. I love everything rainbowy!!!! That's why I want to take part in the next swap so badly!!!! Wow!!!! That looks fantastic! !It's so amazingly beautiful. Ack! Oh my goodness, this is over the top fabulous! The colors just flow so so perfectly and I LOVE what you did with the edges! I never would have thought of that, and it is just perfect. I have the sign up date marked in my google calender for the next charm swap, hopefully I make it in! Knew it was going to be totally and utterly awesome! Brilliant! I knew that was going to be unbelievable and I was right! Thanks for sharing that beautiful creation with us!!! That is so amazing!!! Wow was the first word out when I fulled up this post. beautiful! What do you use for a design wall - flannel? 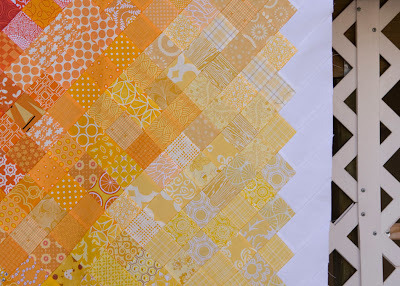 Do you put any spray baste to help the fabric stick? 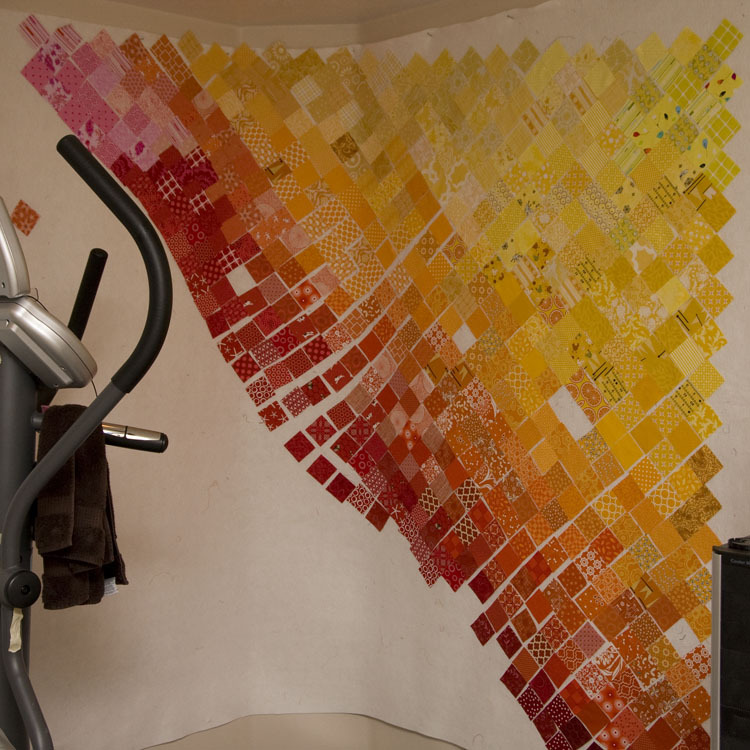 I didn't know anyone else was obsessively trying to organize the commercial fabric of the world by color. 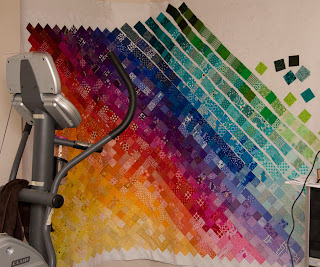 ;-) Your piece looks like it could fit into my Fabric of the Year series (http://artquiltmaker.com/blog/tag/foty/). 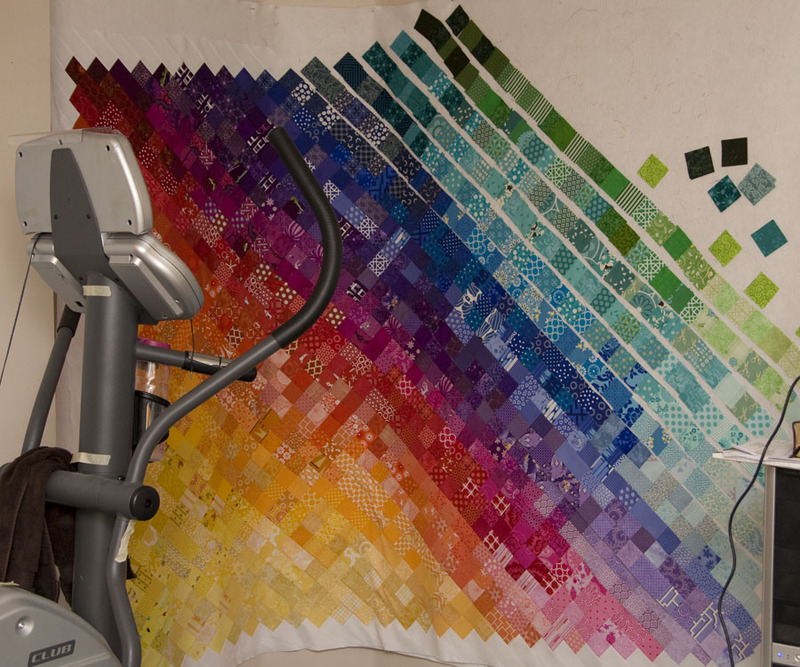 I haven't been following the making of this quilt, but am interested to go back and investigate your motivations. Love it! You're a total rock star, Kati! I loved the "progression" photos as much as the finished top shots. Can't wait to see the backing. Wow, I'm blown away by this quilt! Amazing work! Yep - Wow. That's awesome. How cool is this? I LOVE how you did the edges and left them! Such an eye catcher! OH - MY - WORD!!! This quilt is BEAUTIFUL!!! How you got all those colors to blend so well . . . good job!!! I saw this on interest today and thought, That reminds me of Kati's pixelated color wheel quilt. Ha! Had no idea this was yours until I read about it just now. 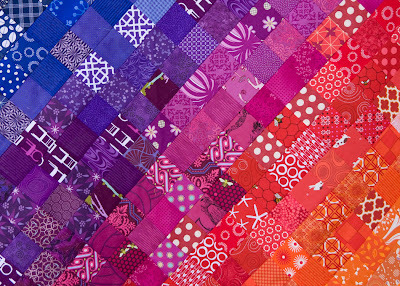 Such pure colors and vivid yumminess all in one quilt!! Congrats on another amazing finish Kati!! Holy goodness! That's so pretty! It is just amazing, Kati! 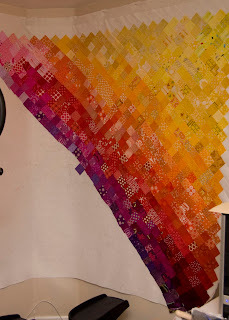 Wow you make fantastic rainbow quilts! Oh wow Kati! I like the pinked edge look too. It's amazing, and I love it! That will be a fun keep-sake. Absolutely amazing, pinked edges and all. I've been wanting to do a rainbowy quilt, and this is quite the inspiration. Hope I can get in on the next swap - just what I need! 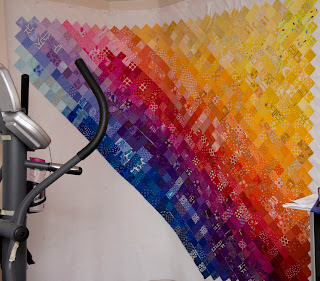 This is a fantastic quilt! Kudos. 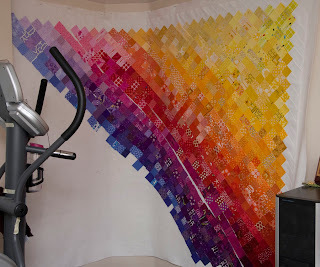 Oh this is totally amazing I think I am inspired for another quilt. Whats this about hug swap you speak of? Absolutely insanely gorgeous Kati! I think it's a perfect use and amazing inspiration for the color swaps. Well done, madam!!! I'm really new to quilting - can you tell me how you're arranging those squares? Are they tacked up to paper on your wall? Or is that a white sheet? Then are they pinned? Taped? I'm curious about your process on that part. Thanks! Absolutely stunning, fabulous and out-of-this-world perfect! Congrats on a beautiful finish!